Suffering from excessive sweating can impact your daily life and affect self-confidence. Many individuals suffer from excessive sweating - also known as hyperhidrosis - but treatment is available to reduce the symptoms. 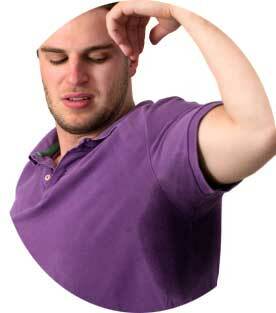 Excessive Sweating – Hyperhidrosis Treatment. A popular and successful excessive sweating treatment involves the use of Anti-Wrinkle injections Treatment. Anti-Wrinkle injections are used to treat excessive sweating, or hyperhidrosis. Excessive sweating treatment is relatively painless and is a non-surgical, quick procedure. Other ways to combat the problem include regularly using deodorant and showering often, but the results are not as noticeable as using Anti-Wrinkle injections for excessive sweating. Does Anti-Wrinkle injections work as an excessive sweating treatment? Many people have found Anti-Wrinkle injections to be a successful treatment for excessive sweating. By preventing hyperhidrosis, Anti-Wrinkle injections has helped individuals to enjoy an active life – both socially and at work – without the worry or embarrassment excessive sweating can bring. How long does the excessive sweating treatment last? When using antiwrinkle injections to relieve excessive sweating it is possible for results to last for up to six months; after this time further treatment will be required. Where can excessive sweating treatment be used? Excessive sweating treatment is not limited to one area of the body as antiwrinke injections can be administered in a number of places. Popular locations for this type of excessive swearing treatment include underarms, hands and feet. Who will perform the excessive sweating treatment? Excessive sweating treatments are performed by one of our qualified practitioners and supervised by Doctor Maria Gonzalez. If you suffer from hyperhidrosis and excessive sweating we can advise you on your possible options. How much does anti-Wrinkle injections cost for excessive sweating? Exact prices to be confirmed during your consultation for Hyperhidrosis. Excessive sweating – don't suffer in silence!